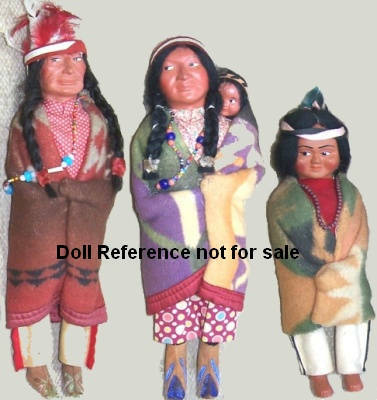 The Arrow Novelty Company of New York, they are best known for their souvenir or tourist Skookum Native American Indian dolls that were made beginning in 1914 by Mary McAboy who was from Montana , the company was founded in 1920 and continued to produce dolls until 1962. 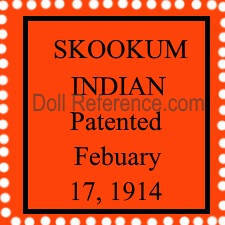 History of the earliest Skookum dolls were made with dried apple heads on a wood frame body, dressed and wrapped in an Indian blanket. Later the heads were made from composition, then hard plastic. The dolls native attire represent various tribes; males, women, children and papooses (babies), in sizes of a few inches to 36" tall. 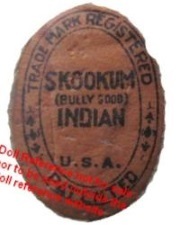 In the1940s to early 1950s the paper identification tags were often affixed to the bottom of the dolls feet, labels or tags read in an oval circle; Trademark Registered, Patented, inside circle, Skookum (Bully Good) Indian U.S.A.
Arrow Novelty also made dolls of cloth, composition, hard plastic and vinyl. 1881-1962 Harry Heye Tammen - H. H. Tammen Company or H. H. Tammem Curio Co. of Denver, Colorado also supplied Skookum dolls, mostly to the west coast under their Tammem label; The HH Tammen Co., New York, Denver, Los Angeles, Skookum Indian Patented February 17, 1914.